Alice Cooper: Golf Monster is the full account of how Cooper became one of the biggest rock stars on the planet with hits like "School's Out" and "Elected", nearly lost it all to alcoholism, and then turned things around by finding a healthy obsession (golf) to replace his unhealthy addiction to alcohol. While most will be familiar with his wild, mascaraed visage and vaudevillian on-stage theatrics, perhaps few will have been aware of the double life Alice Cooper leads. He still tours the world with his band, playing a hundred gigs a year; snake coiled round his neck, beheaded by guillotine at the end of every show...but three hundred days out of that year, Cooper is on the course. 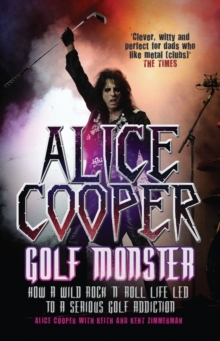 Alice Cooper: Golf Monster is an unlikely and captivating tale of wretched excess, life-saving redemption, ghoulish make-up, power chords, and five-irons to the centre of the green. Both humorous and candid, this book reveals another dimension to a man who has epitomised rock 'n' roll for the last forty years.